This is one movie that can be watched by a 3 year old baby as well as a 70 year old human being and both these age groups will definitely be touched by this gem of a movie.This was the first Iranian film to be nominated for an Academy Award. It lost the "Best Foreign Film" award to Life is Beautiful in 1998. The story revolves around Zahra and her big brother Ali. Ali is in third grade and Zarra is in class one. The love they have for each other is marvellous and I would ask all parents to make their kids watch this movie. It is indeed a classic example of one of the best brother-sister love ever caught on screen. 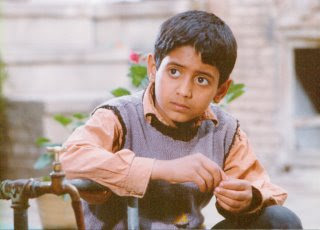 In the movie, Ali takes his little sister Zahra's shoes to the shoemaker to be repaired, but loses them on the way home. The siblings decide to keep the predicament a secret from their parents, knowing that there is no money to buy a replacement pair and fearing that they will be punished. They devise a scheme to share Ali's sneakers: Zahra will wear them to school in the morning and hand them off to Ali at midday so he can attend afternoon classes. This uncomfortable arrangement leads to one adventure after another as they attempt to hide the plan from their parents and teachers, attend to their schoolwork and errands, and acquire a new pair of shoes for Zahra. 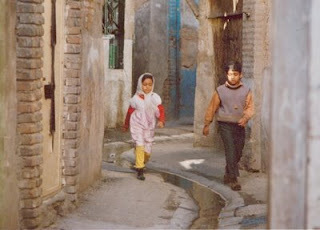 Zahra sees the shoes on a schoolmate's feet, and follows her home, but the two soon become friends. I watched this movie with a four year old kid. Certain scenes from the movie welled both our eyes. I was really amazed by the effort put in by the director in pulling out the emotions of the audience irrespective of their agegroups.. Majid Majidi has become one of my favorite directors. now. although, life is beautiful is one of my all time fav movies.. have you seen it? i should get hold on this movie, i guess..!! I was so touched by it specially when the boy finishes the race as the first though he tries a lot to come third for those shoes. And then also at the times wen the brother and the sister exchange the shoes. I loved the movie very much. wanna see this for sure! 'Life is beautiful' is also a cult movie of its kinds. No wonder it won the oscar. Wow ..where do i get this movie yaar? It sounds very sweet. Shall try to get a hold of it sometime. Yes I saw the ending of the movie on TV once. I saw the race. And I cudnt understand y the boy was crying in the end. Now I know. By the by, ur orkut account does not exist anymore? why cant our own directors make something like this? dont know why they waste money and time in making the most horrendous movies! sure thing dude.. worth watching..
welcome back.. did you read the post? this movie was also filmed in Chinese by a Singaporean director.